Do You Have the Power ? Conscious Isometric Contractions are the key to successfully isometric achievements be it in weight loss, muscle building. It is not enough to simply hold a given Isometric exercise position. All you are doing then is posing, it might feel like you're working but you aren't.
" It's a workout and an intense one at that! You should be exhausted and unable to contract the muscle fully after the 7-12 seconds. During the contraction, the muscles should be shaking like a leaf, feel like they are filled with battery acid and you should be pumping sweat and gasping for breath nearly. If you aren't then it's likely you aren't contracting hard enough or producing the maximal stimulation possible and won't get the best results. Additionally, depending on the muscle being used. On relaxing the muscle well may want to lightly float up or contract again. For instance in doing a biceps curl, after the conscious isometric contraction on relaxing the muscle, the arm may want to lightly contract and bring the hand to the shoulder. This can be a useful subjective text of contractile effort". But how do you do a contraction that intense? Maxick Performing conscious Isometric contractions. This requires concentrated application of effort and tremendous will. The fibres we are contracting in Isometrics (FG fibres as detailed in Perfect Body and Project Dragon) do not engage easily. In some cases pre-exhaustion is necessary and for those students learning to contract the 5 phase process outlined in Project Dragon and Isometric Mastery may be most useful, moving from a full range of motion to an isometric contraction teaches you which muscle to contract and artificially, due to excess load produces the FG contraction we wish to voluntarily create. But I'm not a huge fan of that...I think it's heating and robbing you of a vitally important skill - that of summoning conscious Isometric contractions. My preferred method is to focus and apply concentrated effort to the muscle I'm targeting. If I can at all I look directly at the muscle and visualise the muscle getting larger, the volume of blood and energy increasing in the tissue. If I can't look directly at it I'll watch the target muscle in the mirror. Other times, when I want the deepest of all possible contractions, I'll simply close my eyes and fully visualise the inner workings of the muscle, it's function, it's purpose, why i want it to be stronger...it is perhaps the most intense of medications. "...my observations at length convinced me that mechanical exercise will not increase bulk or strength beyond a certain degree. 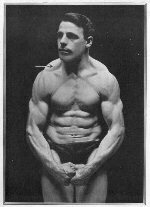 I found out later by experiment that mechanical exercise will only produce good results if interest is directed to the muscles being used. If the mind is directed only to the work being preformed, a certain point of muscular resistance is reached; but not there it stops. To secure full benefit from the exercise, it is essential that the mind be concentrate on the muscles, and not on the work performed"
This is the essence of conscious Isometric contractions. Here's one final example - a good friend of mine repeatedly tells this story. One day he and I were at the gym. I was showing him an Isometric Bench Press, the same type used in Project Dragon. He could not move the bar for love nor money. He tried again and again and it's wouldn't budge. I knew he was capable of doing this. I knew the strength he had developed. He was however focused on the MECHANICAL movement of pushing the bar. I told him instead to focus on the squeezing his chest muscle tight - of bringing his elbows closer to the mindline. He closed his eyes and focused solely on the conscious contraction of the muscle. The bar, loaded with over 500lbs shot up. He opened his eyes and thought it was a miracle. His mind was blown. He still talks about that experience in awe. Connect with yourself. Focus solely on the conscious Isometric contraction. Nothing else exists. This will transform your isometric practice. This will not only bestow upon you a stunning physique and superhuman fitness - it will train your mind to laser like focus as well. With these exercises you can build insurmountable will that will stand to every achievement in your life. You've been reading about conscious Isometric contractions. Try a few free isometrics - here.